As a teacher, I am always looking for books for my students to read. 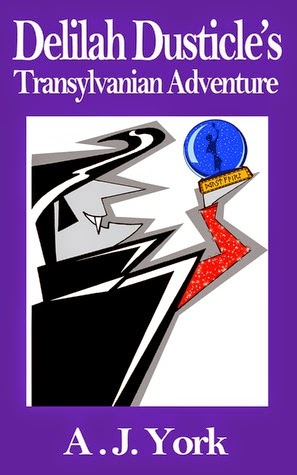 That’s why I was eager to pick up Delilah Dusticle’s Transylvanian Adventure by A.J. York. Fantasies are beloved by most middle grade readers and I thought that this book might be a good addition to my library. I am happy to say that Delilah Dusticle is a funny, charming adventure that would be enjoyed by both boys and girls. Delilah has special abilities. When she is happy, she is able to get rid of dust. However, when she is sad, she makes dust! She creates a partnership with a friend, Abi, and the two of them (with a few other friends) create a housecleaning business. When they are contacted by Count Dracula, they are offered a job in Transylvania, cleaning the Count’s house for a house party. Unfortunately, things do not go smoothly when Delilah arrives. While the party is a lot of fun, not every guest is who they seem to be. Toward the end of the book, we learn that Delilah is a brownie, and she has to learn to control her abilities to overcome her challenges. This book had some great comic touches that any child would appreciate. Count Dracula, rather than being scary, enjoys dancing and dressing up. The supporting characters are funny and charming. Also, there is a bit of historical reference to World War 2 and spies. Delilah is a smart, strong character who learns a lot about herself. My one quibble is that there is not enough dialogue at the beginning of the book. The exposition bogs down the book and makes it a bit less interesting than it could be. This problem is resolved in the last half of the book, though, and I think that the second half of the book would have been even better if it had been a little longer. Middle grade readers will really enjoy their time with Delilah!